Dubai is one of the seven emirates of United Arab Emirates (UAE). It is considered as one of the best places for vacations and tourism. Most of its economy comes from tourism, real-estate etc. It is located in the Persian Gulf of UAE. Dubai shares its boundaries with Abu Dhabi, Sharjah and other emirates. Primarily being a desert, it has an amazing history. The geography of Dubai is a lot different compared to other emirates. Let us go through the information on its history and geography and increase our knowledge about this emirate of Arab Peninsula. Today Dubai is seen as an economic hub, an appealing country, a place that everyone wants to see once in their lifetime. While on the other hand, if we go through its history, it shows a complete contrast of what it is today. Sand dunes, oases, desert shepherds and roaming nomads were common traits of this land. In 1883, a harbor called Ceek was where some fishermen earned their living by fishing. Alongside of the coast was a large market where business thrived. As population grew in 1930 to 20,000, by 1950, the Creek began to silt. Sheikh Makhtoum decided to build a waterway which made Dubai a huge trading hub. 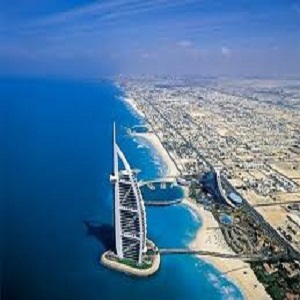 Thus the today’s lavish Dubai has its history originated from those fishermen on the coast. As mentioned earlier, Dubai is located in the Persian Gulf Coast of UAE. While it has its borders touching national Emirates like Sharjah and Abu Dhabi but Sultanate of Oman is the only international state that touches its border. The unique geographical location benefits Dubai in a way that it helps link to all of the Gulf States with the inclusion of South Asia and East Africa. It has an urban area of 3886 sq km. Since Dubai is basically desert area, so the climate there is warm and sunny. However humidity is found near coastal areas. Population of Dubai is about 1.5 million and it has been growing by 7% each year.